What is the Pilaf Method? When professional chefs cook rice, they often do it using specific methods that may help the home chef achieve better tasting and better looking results. Perhaps the most well known; the risotto method, results in a soft, delightfully oozing and rich rice dish called a risotto. The texture of the risotto is achieved by using a high-starch rice (such as Arborio or Carnaroli rice) and slowly introducing controlled amounts of hot chicken stock to it while stirring to draw that starch out. The second common method, often used for more conventional rice dishes, is referred to in many culinary schools as “the pilaf method.” Use this method if you are looking for pretty looking rice with distinct grains that fluff up very nicely. It’s a great way to showcase the beautiful colors and distinct textures offered by our bulk specialty rice varieties. If you’re looking for an Asian style “sticky-rice,” simply cooking on a stove or in a rice-cooker as you normally would is the best way to achieve this. 1. In a medium saucepan, heat oil or butter and sweat finely diced onion (1/4th cup of onion per cup of rice) until translucent. 2. Add your rice to the pan and stir it until each grain is coated with oil and shiny (this is called “pearling”). If desired, you can toast the rice slightly before moving on to the next step. Many chefs believe that pearling your rice helps the grains to stay separate once they have been cooked. 3. Add your cooking liquid. The most commonly used, of course, is water, but you can also use a stock such as vegetable stock or chicken stock for extra flavor. Just keep in mind that if you are cooking white rice, using stock may change its color. How much liquid you add depends on the type of rice you are cooking, as different rice types absorb different amounts of liquid. Your rice’s package (or our product descriptions) will tell you how much liquid to use. 4. Add salt to season. 5. Bring the liquid to a simmer, turn the heat to low, and cover. 6. Cook the rice on the stovetop until it is tender (you can also put the covered pot in a 350 degree oven instead if you need stove space). How long the rice needs to cook, again, depends upon the rice you’re using. 7. Once the rice is tender, uncover it and fluff it with a fork to allow steam to escape (failure to do this can result in overcooked rice). If you need to keep it warm, replace the cover after most of the steam is gone. 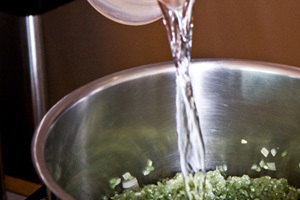 – Add a bay leaf when you pour in the liquid. It will impart flavor, and should be sitting on top of the rice waiting for you to pull it out (having floated up as the rice cooked) when you take the lid off. – Add different vegetables at the beginning. Bell pepper, carrot, celery, garlic, shallots, or scallions can all be added to the pot at the same time as the onion (and should be cut as small as, or smaller than, the onion). – Toss the finished rice with ingredients you want raw or have cooked separately. Peas, raisins, spinach, chopped nuts, etc. – For added richness, stir extra butter in to the finished rice while it is still hot. The pilaf method delivers particularly stunning results when used with our colored rice varieties like green bamboo rice, and Chinese black rice.